I was very giddy on the day I got an email from the Art Director at Supergiant Games. Both Bastion and Transistor are personal favorites of mine and I jumped at the chance to be able to make something for this studio. 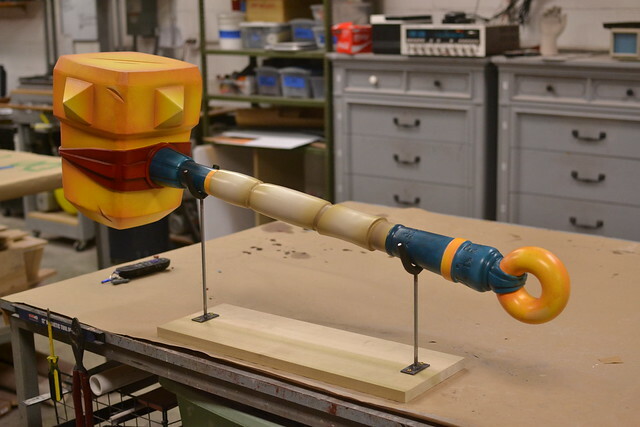 They needed a copy of the Cael Hammer, a weapon wielded by The Kid from the very onset of the game Bastion. Since the game takes place in 3rd person isomorphic perspective, new higher-definition renders were created for me to use as a reference. 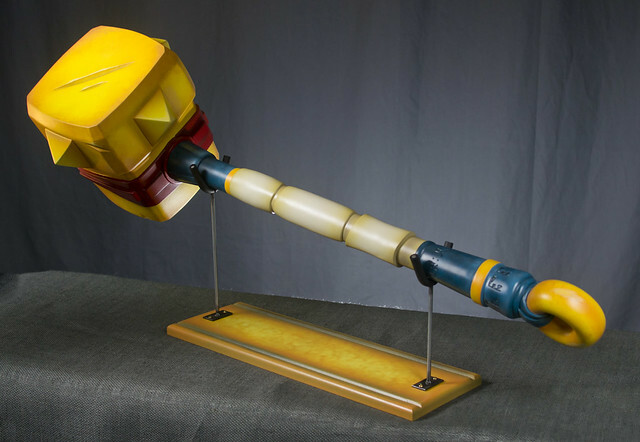 The hammer itself would be used alongside a green screen for attendees at PAX East to pose in the world of Caelondia. The finished piece needed to be very lightweight but also durable, and blend into the high contrast illustration that would make up the background. 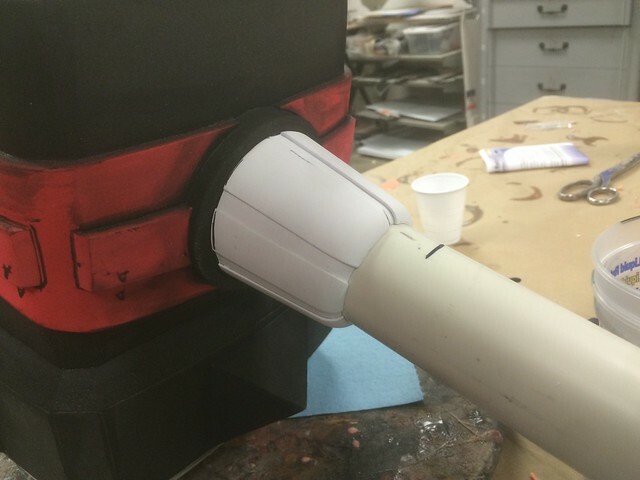 EVA foam seemed to be the best solution. I sourced some 4×8 foot sheets in 0.5″, 1″ and 2″ from foambymail.com and set to work. This was way more than I needed, but no problem with stocking up in advance. 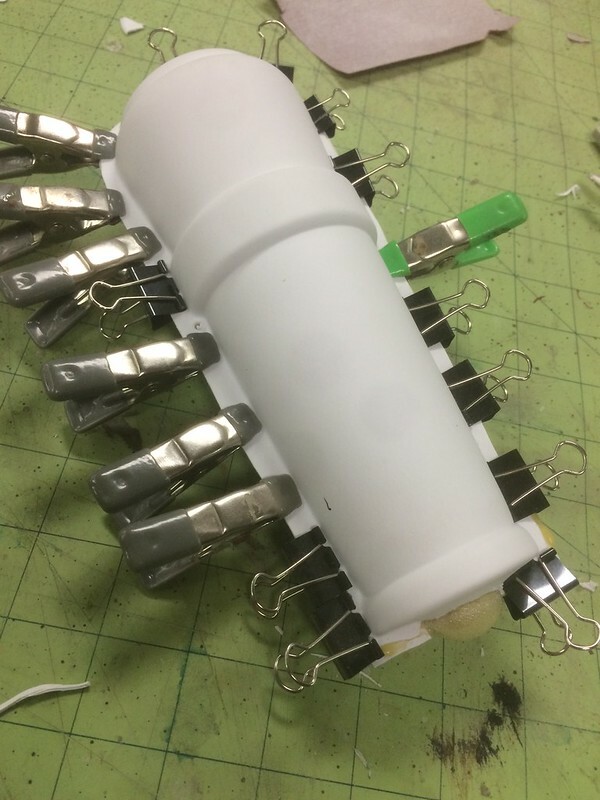 This is only my second foam build, and I’d like to take a minute to thank people like Evil Ted Smith and Punished Props for their detailed tutorials on working with EVA foam. 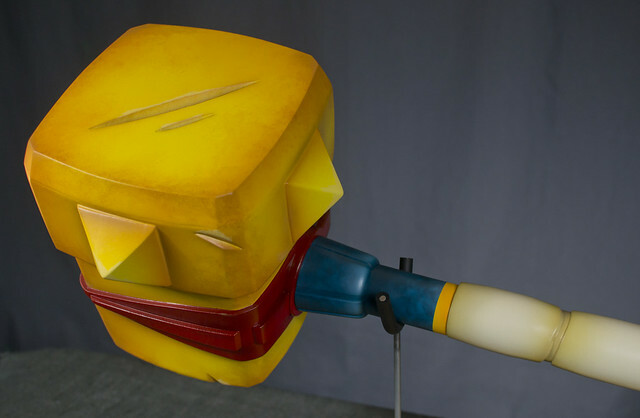 Ted has a great series of YouTube videos here, and Bill Doran’s books on working with EVA foam can be purchased in my online store. 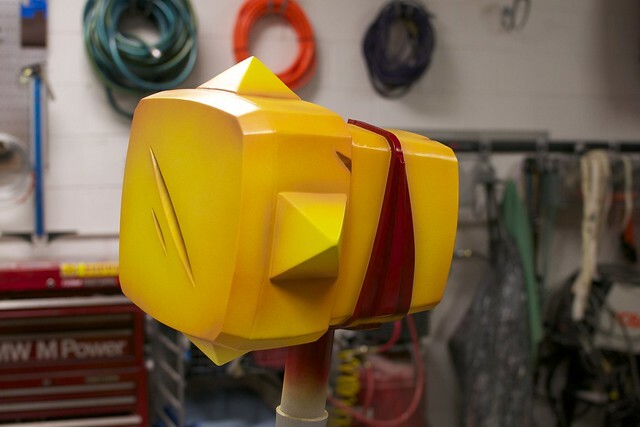 Most of the hammer was free handed based on a set of illustrations I made off the new render. 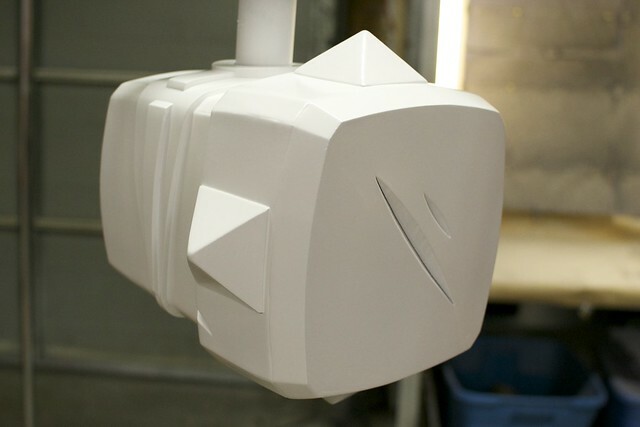 Larger areas like the face were cut from thicker 1″ material, while the sides of the head were cut from 0.5″ material. I used barge cement to glue all parts together. 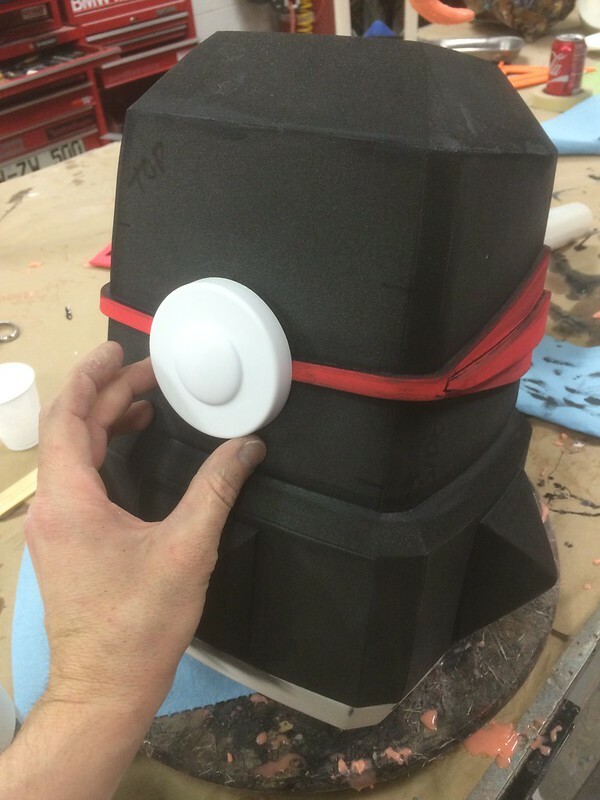 The super thick 2″ foam came in really handy for the side spikes as well as the large back side of the hammer head. 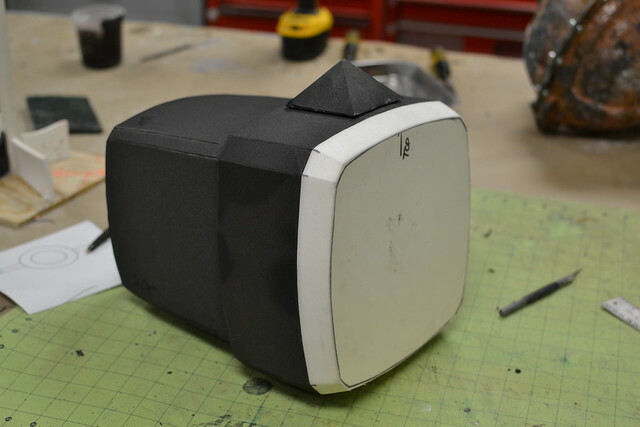 Cutting tapered forms out of thick material means slightly more weight, but also less seams that need blending. Spikes were trimmed on my bandsaw by setting the work table at an angle and cutting each face individually. The large back section was shaped by hand on a belt sander. 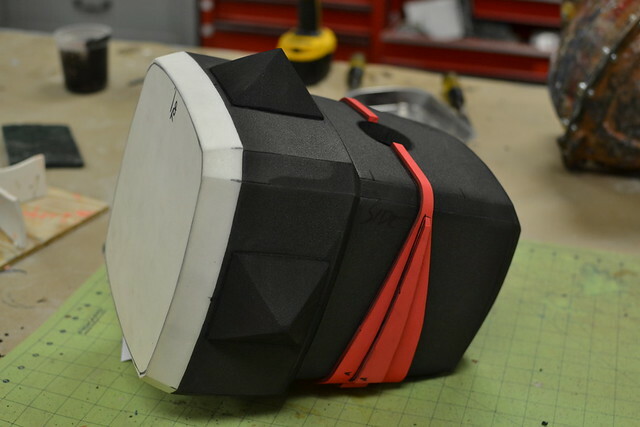 Thinner 6mm and 2mm foam sheets were used to make the red band across the mid section of the head. 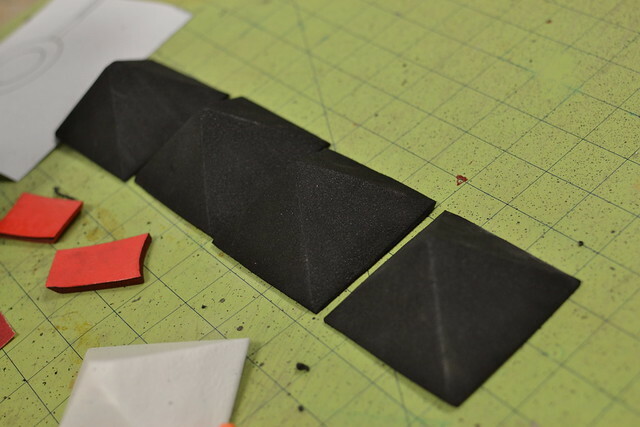 For all the thinner foam parts I used an exacto knife for cutting. 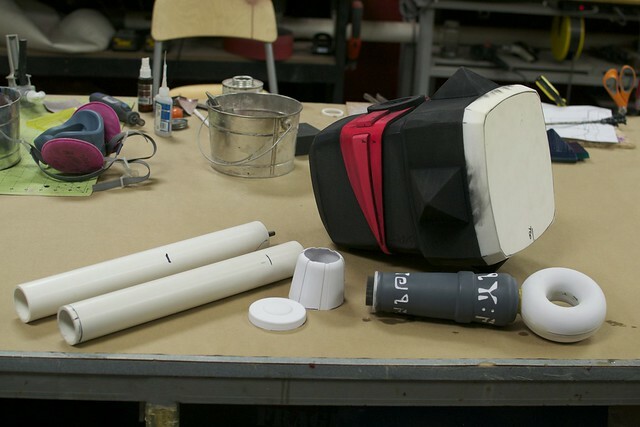 Several parts needed to be made a bit more robust than EVA foam. 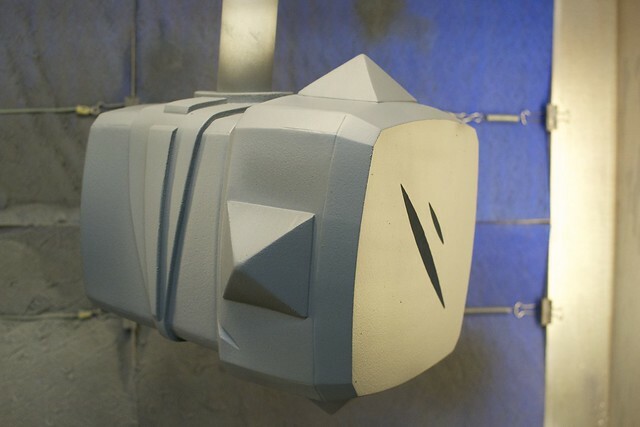 The pommel would contact the ground a lot, and a few bits on the hammer head would be easier to construct from rigid plastic. 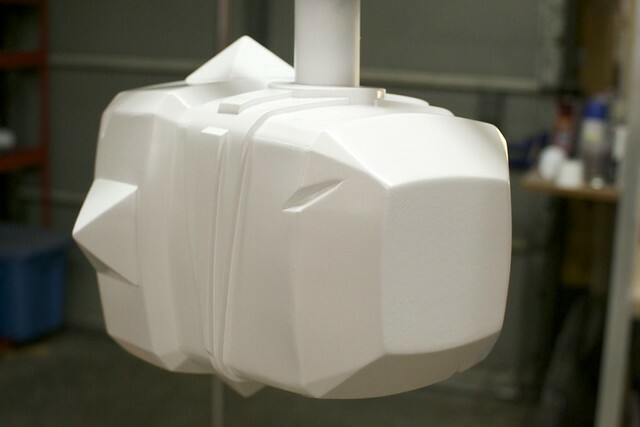 Since they still needed to be lightweight, these pieces were vacuum formed out of .060″ styrene sheet. 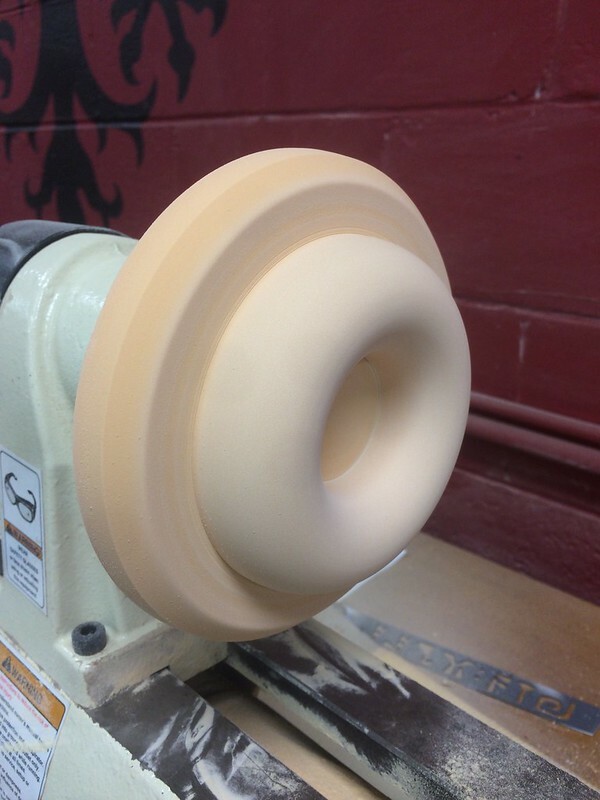 I started with the pommel, turning a forming buck out of urethane foam. 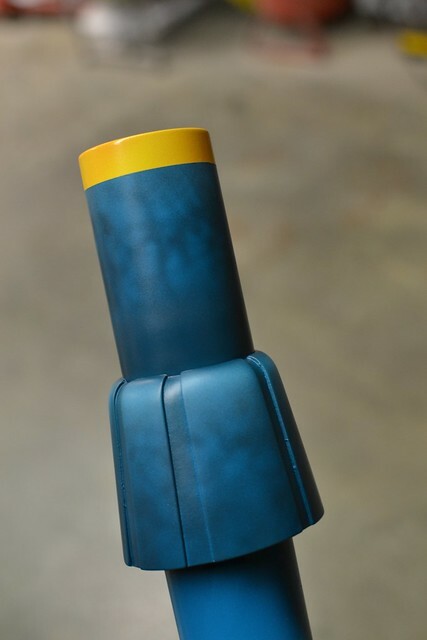 Parts for the neck and top cap were also turned from urethane foam, as well as the large donut half that would make up the bottom part of the pommel. 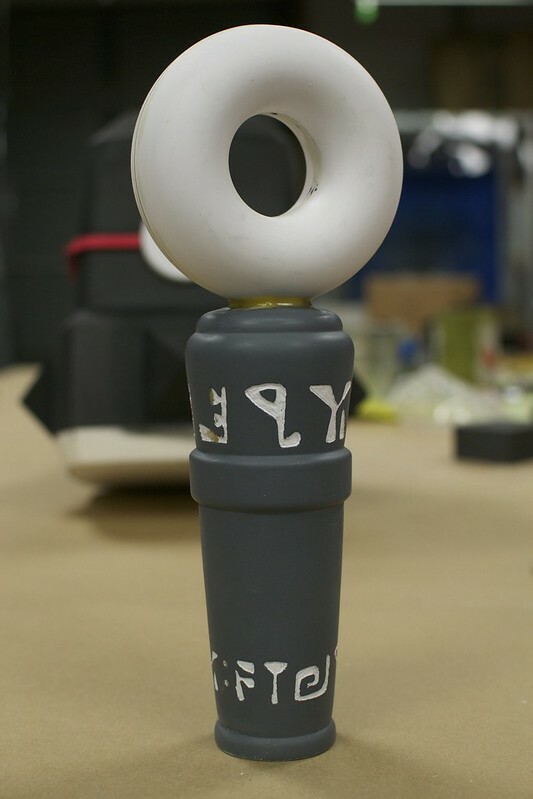 Before trimming, the pommel halves were glued together using methacrylate to make full continuous parts. 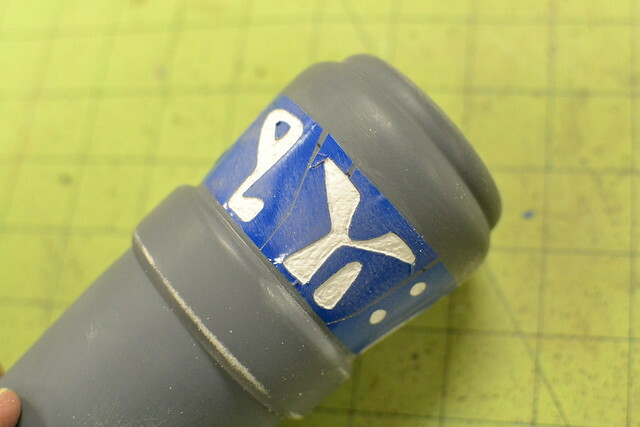 Once the glue dried the seam lines were sanded off. The pommel has some Caelondian writing in two different sized rings. These were first trimmed out of vinyl then laid over the plastic to act as a guide. 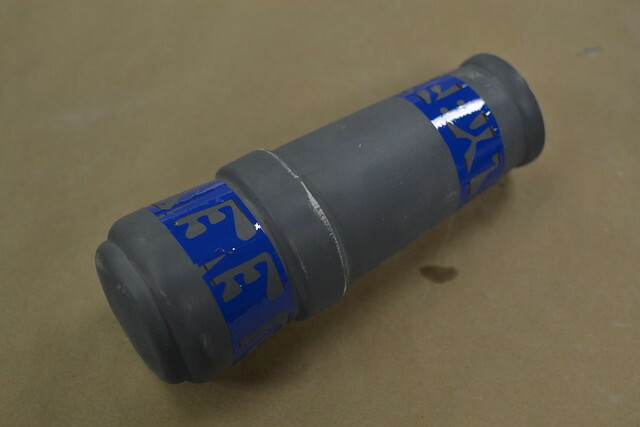 The engraving was done by hand with a rotary tool and ball engraving bit. 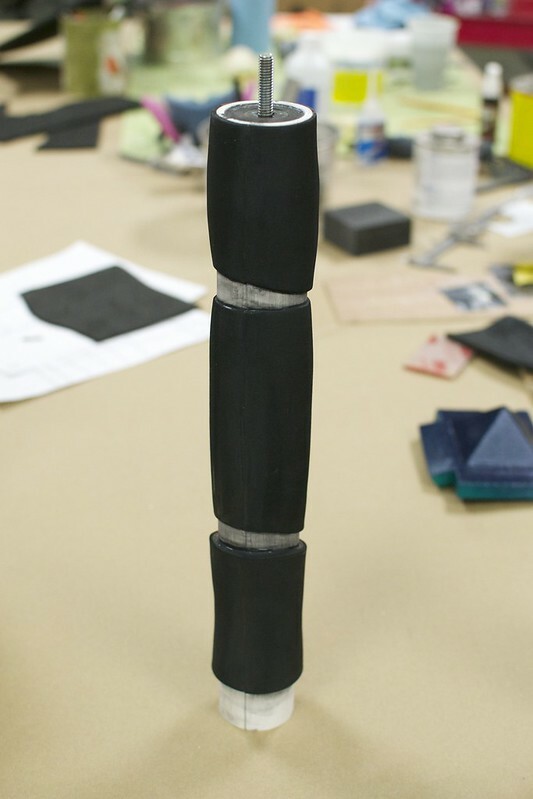 With the base sculpting done the two parts were glued together using a steel bar between them for rigidity. 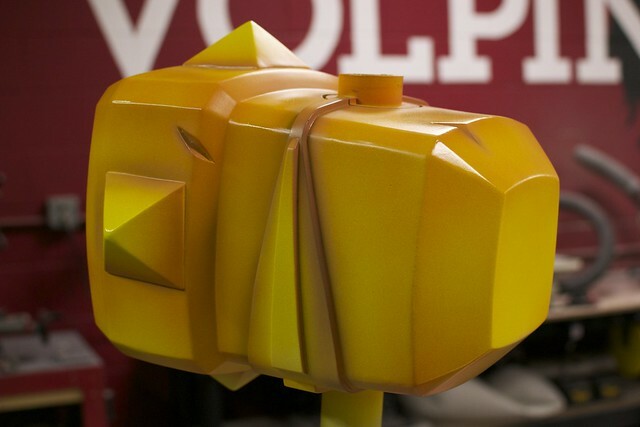 Apoxie Sculpt was used to make the ornamental band that secures the ring to the rest of the pommel. 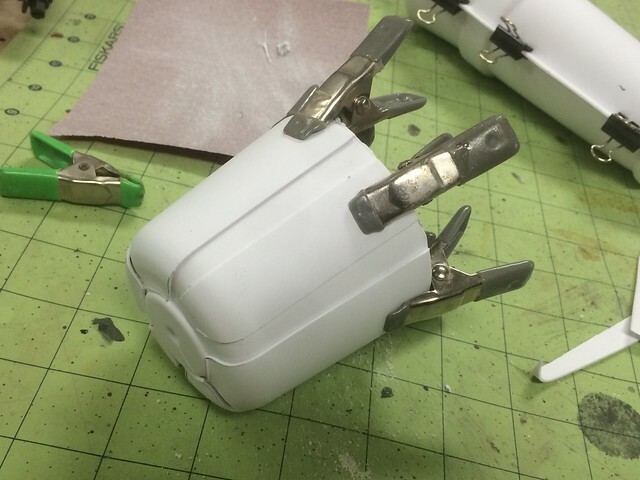 Other styrene parts taking shape: the top cap for the hammer head and the lower hammer neck. 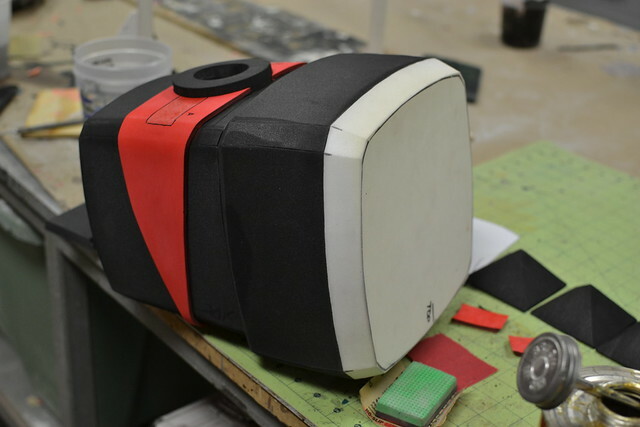 Both parts seat into a thin score line cut into the foam to better hide seams between the disparate materials. 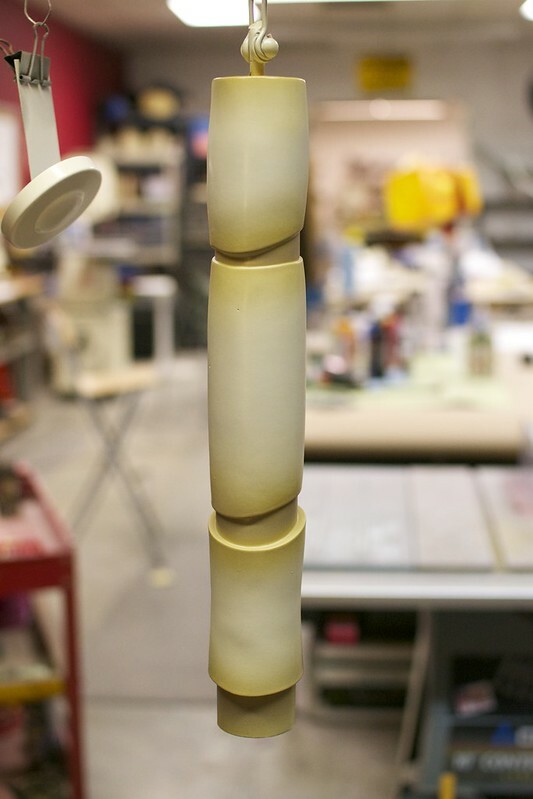 To add rigidity to the head, a section of PVC pipe runs from the top cap through the bottom and ends in a threaded nut. This connects to the other PVC section that forms the handle. 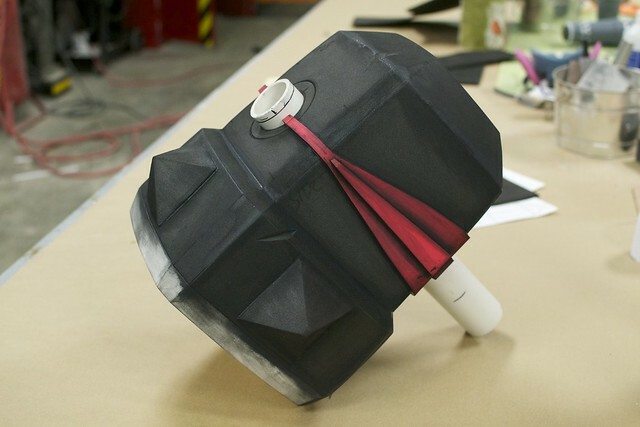 More EVA foam was used to simulate the handle wrap. 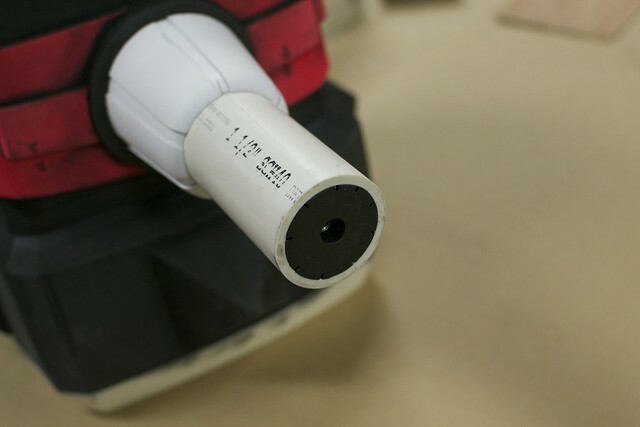 To get the tapered look, material was sanded off the back of the foam to make it thinner before gluing it down to the PVC pipe. 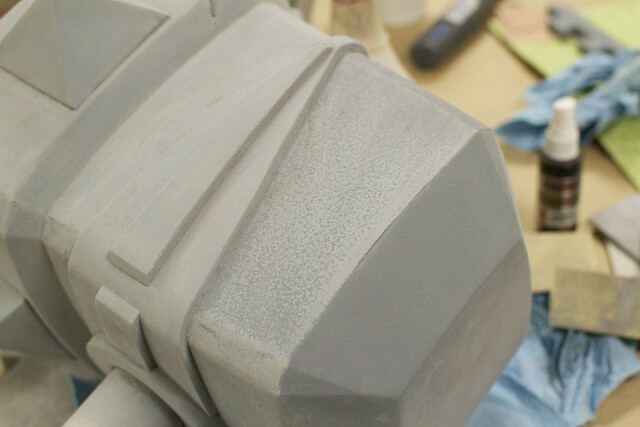 By sanding the back side, the smooth surface of the foam is kept intact and greatly reduces cleanup later on. With all the parts complete it was time for paint! 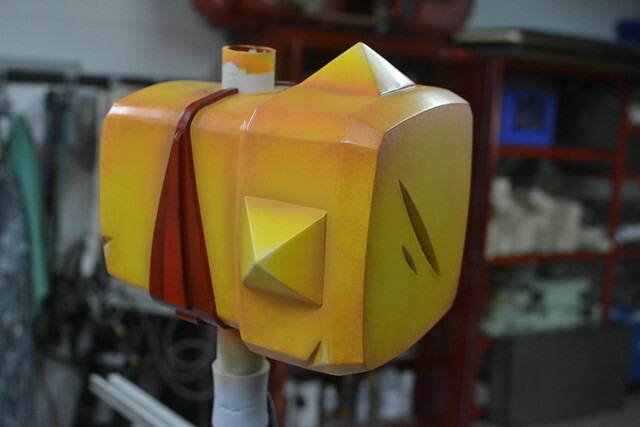 There’s a lot of different schools of thought when it comes to painting EVA foam, but my techniques are based largely on the work of Evil Ted Smith and Punished Props, with a bit of my own invention here and there. 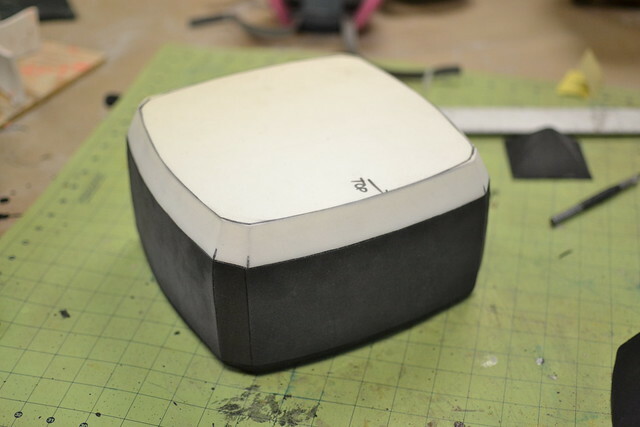 Firstly, I needed a way to hide and blend a bunch of the seam lines between the foam panels. I found a tube of thick acrylic paint called Gallery Glass that’s normally sold in craft stores as a way to fake stained glass leading. Since it’s made to dry even when applied in very thick coats, this stuff worked wonders at filling in seams. It’s even flexible! In the shot below, all the black smears are Gallery Glass filling in the seam lines. After letting the filler cure overnight, I sealed the foam with white Plasti-Dip. I decided on white since it would be easier to see even coverage over the predominently black panels used on the hammer construction. It took about 7 thin passes to get a fully sealed, opaque coat. 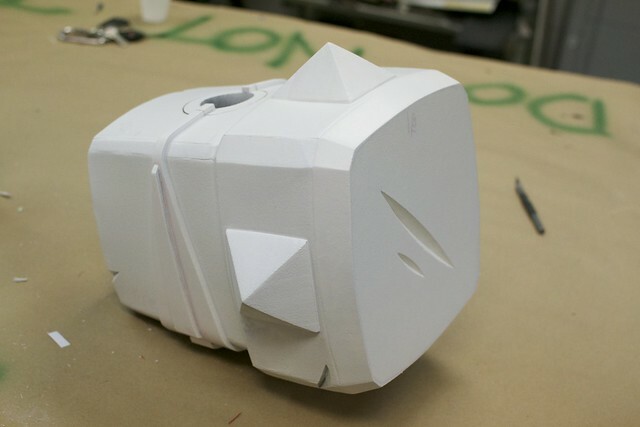 This was given another 48 hours to dry before priming with 2K Urethane Primer. I added a bit of flex agent to this coat to allow it some give with the foam and Plasti-Dip. The nice thing about a high build primer is it can be sanded back down to make a very smooth surface. 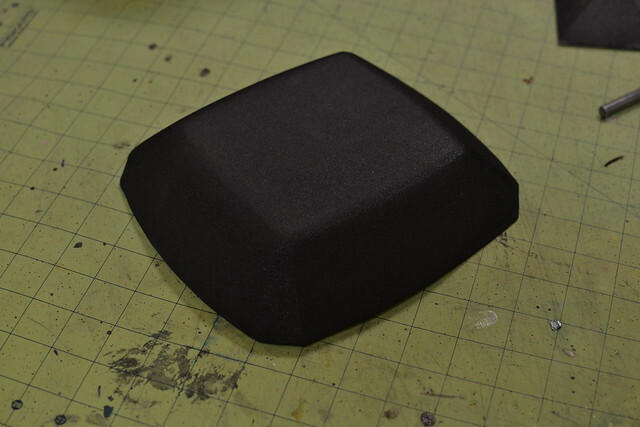 A few passes with 320 grit sandpaper and the rough pebbly texture of the Plasti-Dip was much smoother. 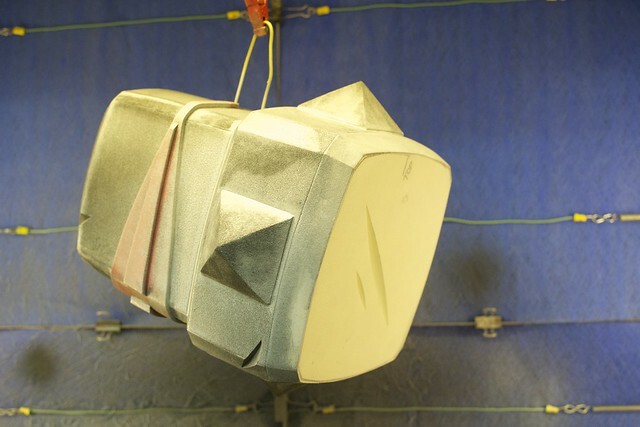 In this photo you can really see the rough texture left behind by the Plasti-Dip. I’d gotten about half of this side of the hammer sanded at this point. 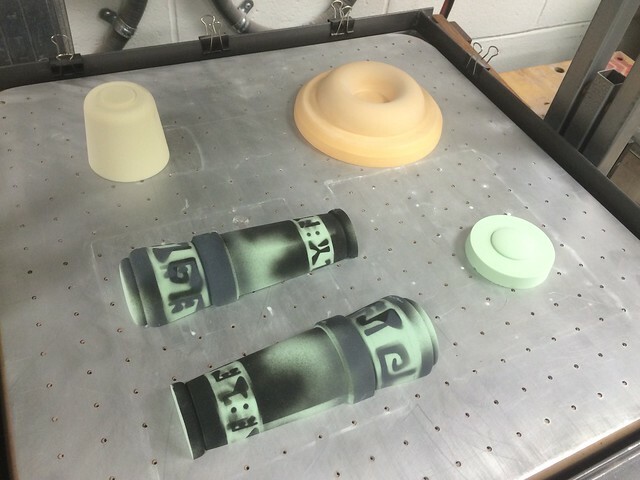 The urethane fills in these divots and sanding makes everything nice and smooth. 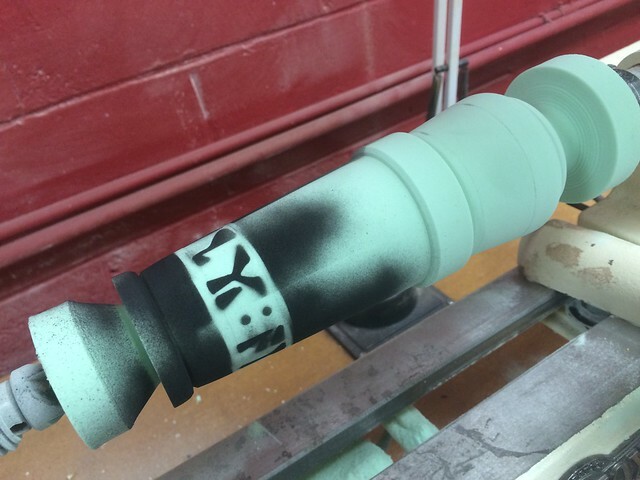 For paint, I started off base coating the entire piece with Createx Wicked Colors white. 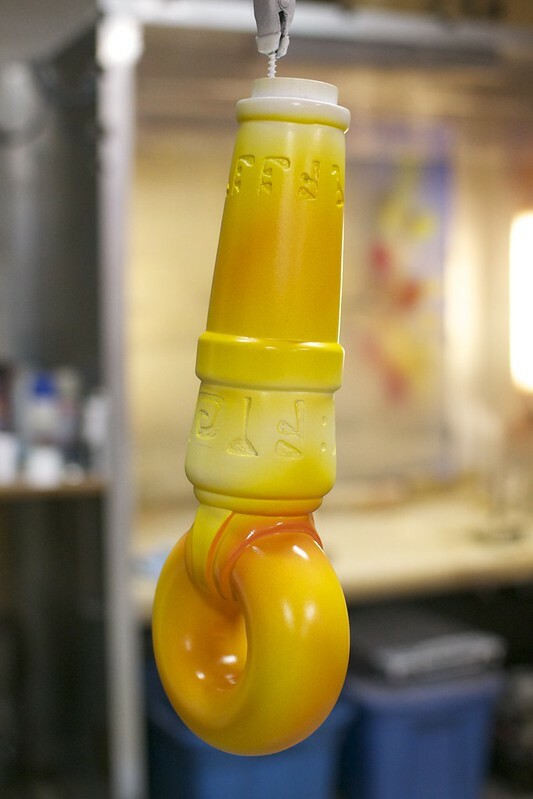 A white base coat means the yellow topcoat will be more vibrant and even. 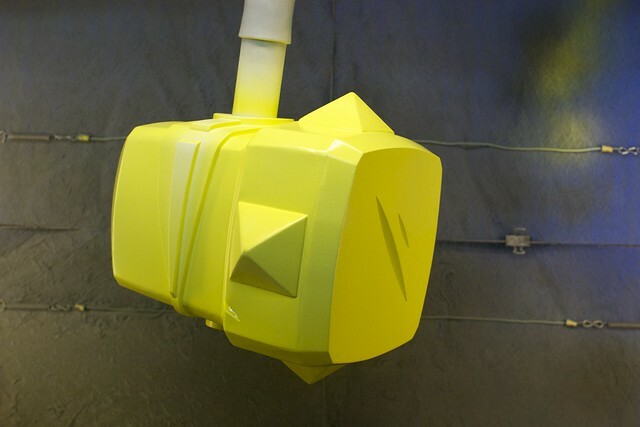 To emulate the painted vibrant style of Bastion, many passes of darker airbrush yellow shades were added to accent the edges and corners of the hammer head. The band was masked off and painted red, with its own gradients and shading. 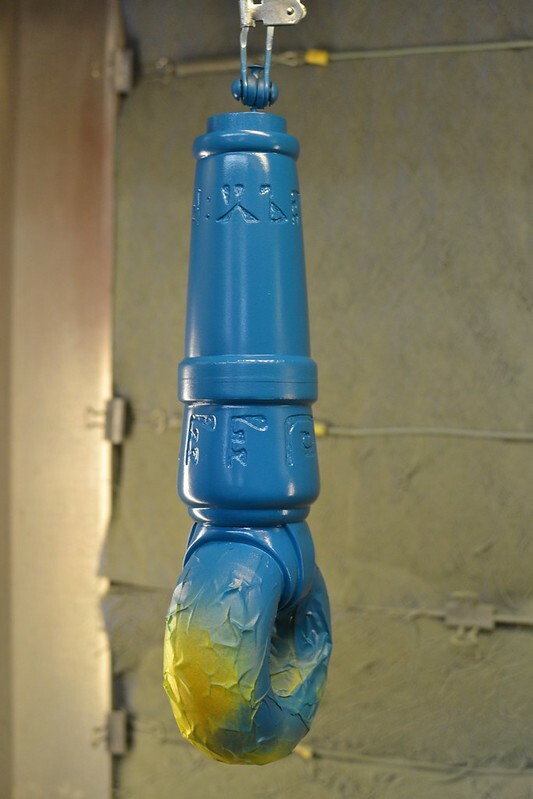 Wicked Colors are great because they don’t require an intercoat clear for masking off layers once the paint is cured. 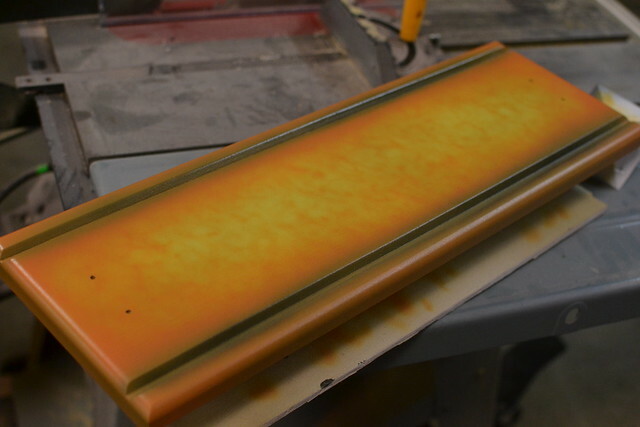 Lastly, the spikes were tipped in lighter yellow and darker orange blotches were added in the corners with an organic sponge. 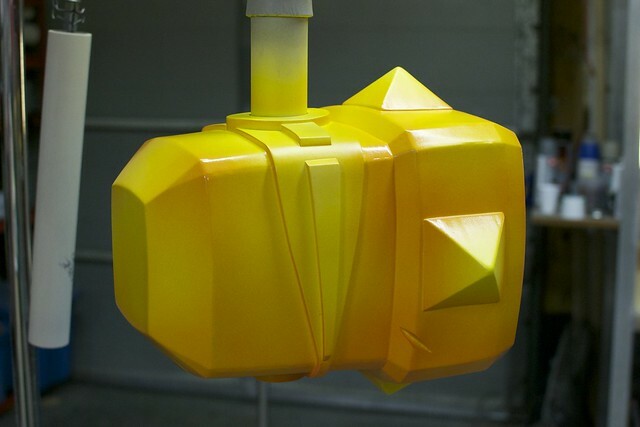 Yellow sections of the pommel were painted in the same process as the hammer head before being masked off to add the marbled blue elements. 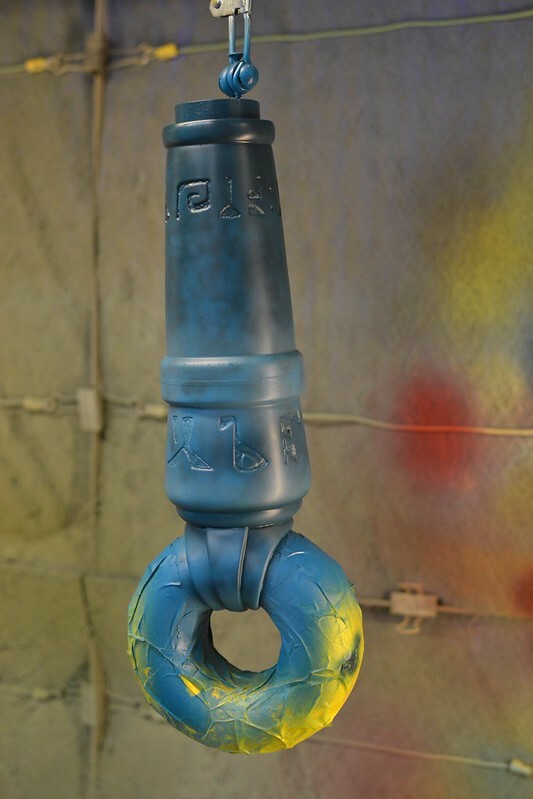 With the yellow behind a protective layer of Tamiya tape, the pommel was basecoated with more Wicked Colors in bright blue. 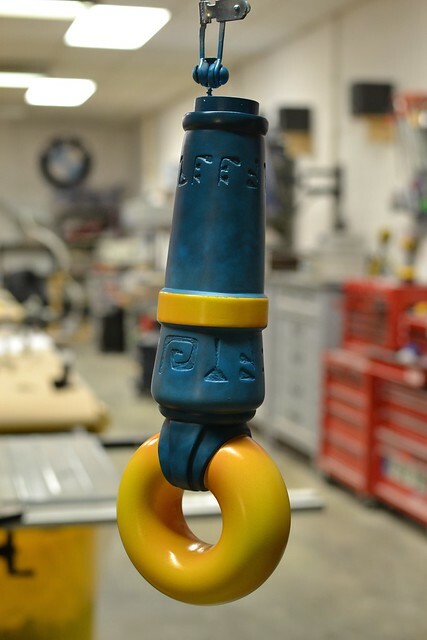 The yellow was painted first because covering blue with yellow would be nearly impossible. 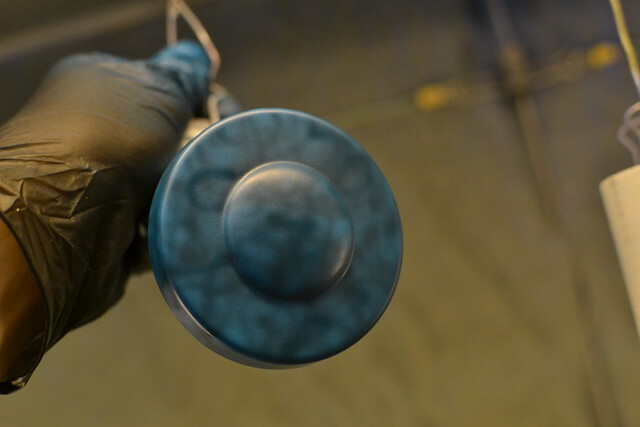 Marbling was added with darker blue by moving an airbrush across the surface of the part quickly and randomly. This is a pretty common technique for SFX artists doing creature work when they’re adding mottling layers to skin. This effect is pretty stark on its own, so it was softened with another gradient pass of lighter blue. With the tape removed, here’s the finished parts! 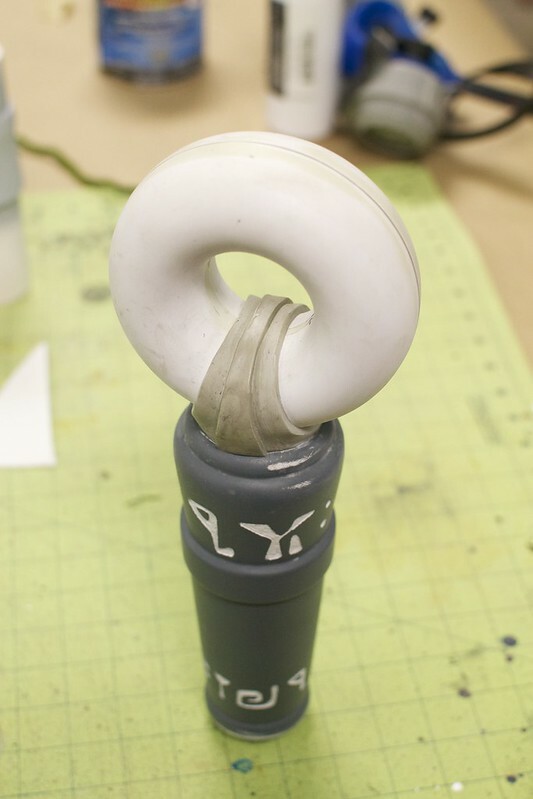 The handle was painted in a similar manner with gradient passes over seams and raised areas. Unfortunately I was in a bit of a build zone when I got to this part and skipped on photographing a lot of the paint process. Whoops! 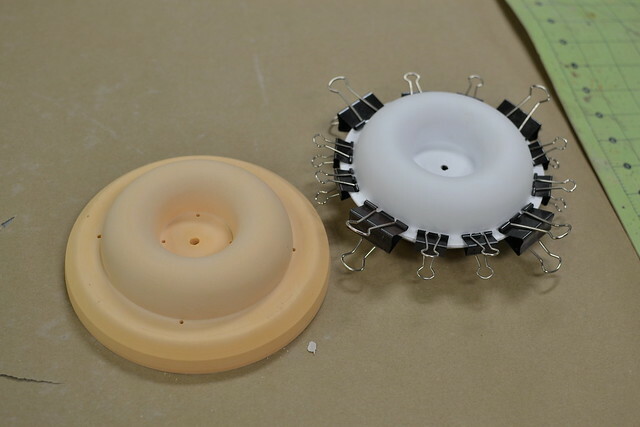 Each component got a coat of flat urethane clear before assembly. I also put together a small display base out of a sheet of poplar and some welded steel bars. I love having a welder in the shop! 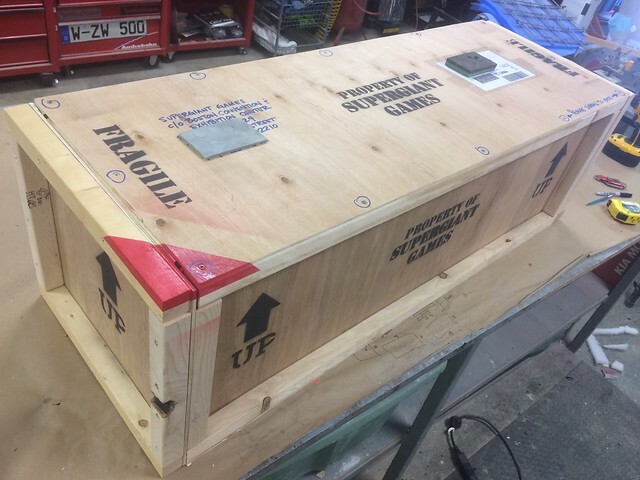 The last component was a massive shipping crate to get the hammer safely to Boston for PAX East. 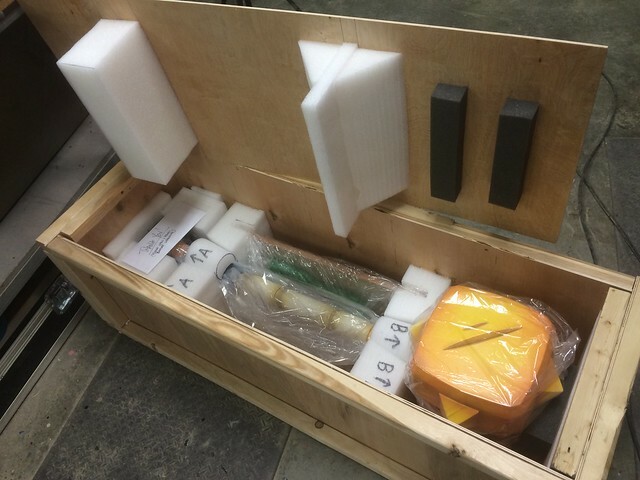 Shipping a 4lb hammer required a 35lb box. It arrived in perfect shape! Here are some shots of the finished product. 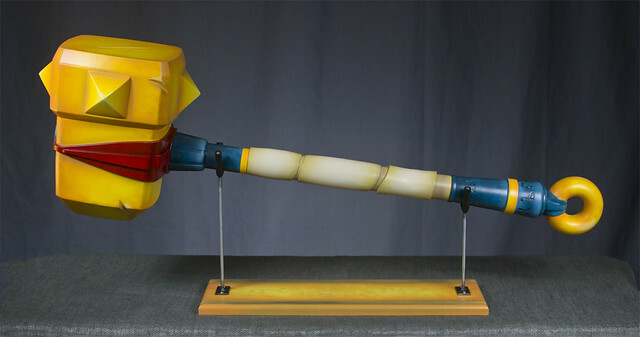 The hammer is about 44″ long but weighs less than 4lbs! You can see them in higher resolution in the portfolio section. 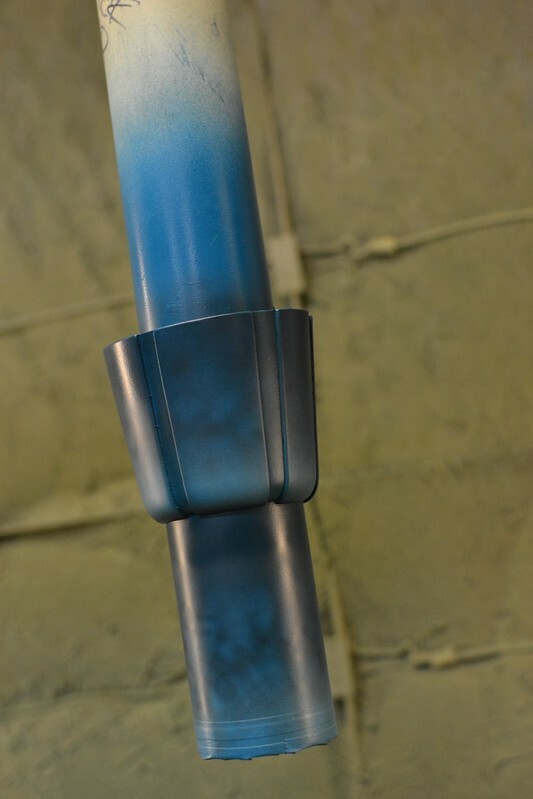 If you’re interested in seeing more progress shots, head over to my Flickr – it’s updated every time I get work done at the shop so there’s always something new to check out.